Niche marketing is one of the several important pieces of the puzzle in selling jewelry online profitably. Jewelry is probably the most saturated area in the Etsy world. Statistics say that there are3,583,594 jewelry shops in Etsy. No wonder I am lost in that jungle and no one knows about me. Shouldn’t I make what most people look for and things that are trendy? A wee voice inside me protests. That is not why I started in the first place. 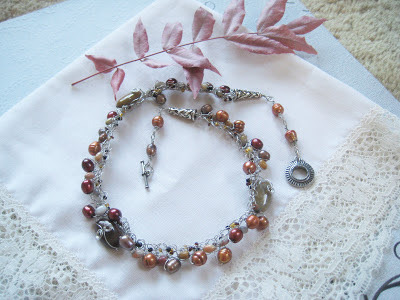 I want to make knitted wire jewelry which is not very common and I love that because I love to knit and I love to create jewelry. I feel confused and hesitant, a bit down too. It helped me get back on my feet. A niche can be defined as a small segment in a market or a subset with in a set. Your niche market must be able to solve one or more than one problems of a group of people. Once you have a clear understanding that who these people are, your marketing will be easier in terms of showcasing your products or advertising to the right crowd. Experts say that in order to survive in the crowd you have to have a niche and show your uniqueness. A concept of the right keywords is very important in this equation. Your niche market or the defining keywords must have substantial demand and low competition. Your jewelry or products must have be a unique style that is not common and not easily available in big box stores or else where. This is tricky because here I find that there are several loose ends that are important and to be tied to make the knot secure in the business of online selling profitably. Your aim is not just driving traffic to your shop but turning those to sales. You must start with at least five high traffic key words and five long tail relevant key words that tie your jewelry niche. Your landing page, descriptions, tags everything in your Etsy shop must be consistent with your niche. Your niche has to be so unique that people cannot leave without buying from you. Your online store must be cohesive with the banner, contents and everything to show off your niche and the brand. In order to sell your jewelry profitably online, what I understand is- it has to be something that you love to do, have the capacity to branch out and expand, keeping the same cohesive and consistent unique brand. This commitment and passion will be crucial for the long haul. Marketing for an unusual niche can be challenging. Listen to Susanna from Mars Bling who makes science jewelry, rather, just Mars related jewelry. She was having problem selling them off line because not too many people are passionate about Mars jewelry. But they are there. Now, there are more than thirty comments in the forum all trying to help how she should market for her unique niche. Another example is when a jewelry artist who makes jewelry out of fishing lures is at a loss. Read the unique comments she got for marketing strategies. In How to sell and make craft the author cautions that your unique tiny niche may get crowded, people may start copying you and sell cheaper and so forth. I believe that the original artist is always superior to the ones who copy. I believe that the original artist does possess that talent to be capable of bringing new twists with in the same niche and thus thrive. Are you convinced that you must have a niche? Do you think it is easier to survive and sell profitably online rather when you make jewelry (or products) for the general public and something trendy? What is your take on that? I am curious to hear your comment and when you leave a link with your comment, people will find you too. Thank you. Ana, Thank you so much for your feed back and the link. I'll go to Lori's site and read it. Dita. Kashmira, You have a unique style that to me says- I am care free, like a whispwer, like wind, I am silly some times and I am darn modern. As I wrote to you I think these opens up to us too as we evolve. Antiquity Travelor- Thank you for dropping by and your warm words. I agree with you on why a niche market is essential for online jewelry business. I have really liked the ideas presented in this article. It is highly insightful, and beneficial with unique ideas that classify best support with any such requirements. Thank you sabina moon for your feedback. Your comment inspires me especially when I doubt that people need to touch jewelry before buying. But looks like with good pictures and great description and communication people like to trust online shopping more these days. There are many online jewelry stores selling their jewelry in the world. So, one thing which makes your jewelry crafts different from other that is uniqueness and different style of jewelry. So never compromise with the quality of jewelry products if you want to make your store more profitable. Thank you very much for your valuable suggestion on gemstone studs. The funny thing is people want just what you don't have. Once I worked hard on studs,in that craft show my clients asked for very large chandeliers. I like the picture of the ring that you have in your web site.